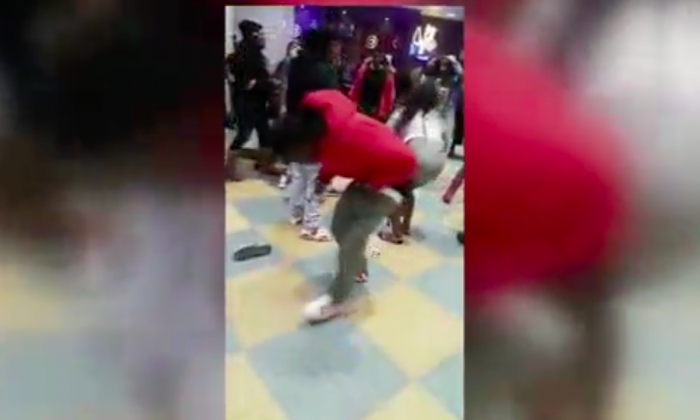 A large brawl broke out at a mall in Newark, California, on Saturday night, Jan. 13, over a missing cell phone that turned out to be sitting in the lost and found. A girl used her Find My iPhone app to locate her missing phone and ended up in front of John’s Incredible Pizza Company in the NewPark Mall, according to police. The mother of the girl told NBC Bay Area that the girl was attacked after she walked up to a group to ask if they had seen her phone. An employee at John’s Incredible Pizza told NBC she saw two women arguing before a physical fight broke out. “Their boyfriends, or males who they were with, backed them up, and then they started throwing punches, and then their friends started throwing punches, and they started throwing punches at other parties that were there,” John’s Incredible Pizza worker Drake Lynn said. Newark police responded to the brawl, but called for backup from Fremont police once they saw the size of it. The fight involved over 20 people, according to a witness who spoke to SFGATE, and took about two hours for police to break up. At one point, pepper spray was used, witness Nicole Davis told SFGATE. In cell phone video she captured of the incident, people can be seen throwing punches and yelling. A staff member of the restaurant tried to break up the fight but ended up getting injured. Minor injuries were reported but no one was arrested. The phone was discovered in the lost and found of the restaurant the same night while police were investigating. “We would have definitely found the cellphone, if they would have just given us a little bit of time and let us do our jobs instead of throwing punches,” Lynn said.